Here are sections from Topeka’s Traffic Regulations that are pertinent to bicycling. Read the original regulations in the city’s CH142-TRAFFIC-AND-VEHICLES. Sec. 142-454. Use of skateboards, roller skates or bicycles prohibited. Sec. 142-611. Riding on sidewalks regulated. KVBC registered a Board member as a lobbyist during the 2011 legislative session, and worked behind-the-scenes to promote a 3-Foot law for all Kansas cyclists. 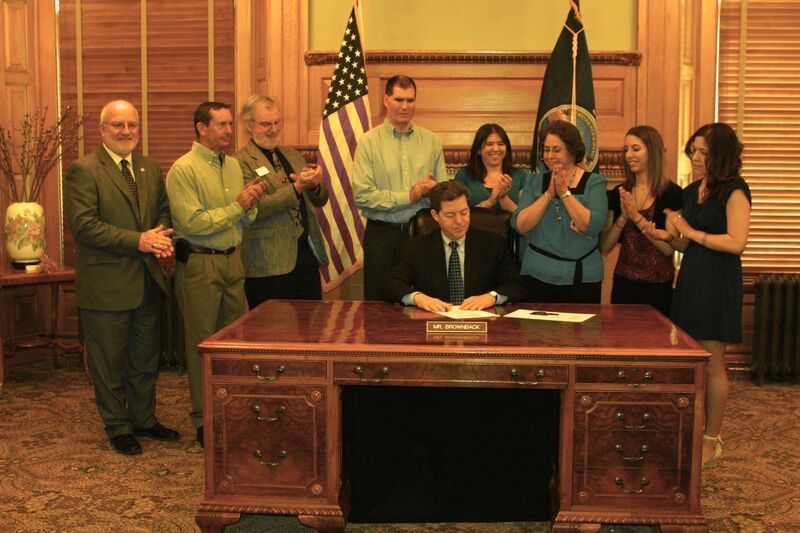 These efforts were successful when Governor Sam Brownback signed the bill into law. It took effect on July 1, 2011. Present at the ceremonial signing (pictured) were KVBC Board members and the Tim Roberts family, who also lobbied for the law after losing Tim in a cycle-vehicle accident. A great debt is owed to all the Kansas cyclists who contacted their legislators and let their voices be heard. Special thanks goes to the Kansas legislators who actively supported the law: Sen. Vicki Schmidt (Topeka), Rep. Vern Swanson (Clay Center), and Sen. Dwayne Umbarger (Thayer). KVBC assisted ABATE Kansas, a motorcycle advocacy group, in lobbying for a dead red provision. This law took effect July 1, 2011. It allows both bicycles and motorcycles to proceed through a red stoplight if the signal is not triggered.